It was eight years ago today, that my son Chaz sustained a spinal cord injury after diving into a powerful wave on Plum Island. After months at Craig Rehab in Colorado, he was given the prognosis that he would be fortunate to just be able to shrug his shoulders. Chaz never believed it. There is no doubt that his athletic background — skiing, surfing, and mountain biking has cascaded into his rehab, and every single day I watch him push himself through pain, obstacles and traditional thinking. I believe he envisions rehabilitation from the perspective of a mountain climber charting his way into foreign, steep and undiscovered territory. Every day he trains, marks his progress, optimizes the present and plans for the future. Last week at his yearly medical appointment, his physician noted that progress was “remarkable.” He has recovered quite a bit of strength in his arms, shoulders, abdominals and back. I know that he has only been able to make this physical progress because of the immense support of family and friends. 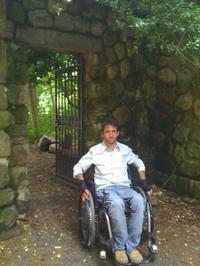 For instance, generous financial support has helped him maintain a wheelchair accessible van. Without this van, he would not be able to travel to physical rehabilitation sessions or to Lesley University where he is a master’s candidate. After years of lobbying, writing letters and watching science progress, I am pleased to be able to write that within the last month two clinical trials aimed at restoring the spinal cord have received the green light by the U.S. FDA. An Iraqi war veteran will be one of the first to receive the stem cell therapy and Chaz is hopeful (and training himself) that will one day become a part of a future clinical trial. As a father, I am thrilled for him. Yet I know that the associated lifetime costs for spinal cord patients are astronomical, between private rehabilitation, equipment, supplies and other medical expenses. By one estimate, the average yearly expense for a quadriplegic is over $138,928 — a financial challenge that Chaz cannot meet alone. Additionally, the CDC estimates that an individual living with a spinal cord injury will have between $500,000 and $3 million dollars in lifetime out-of-pocket expenses. To help offset such expenses, a fundraising campaign in Chaz’s honor has been established with HelpHOPELive, a trusted nonprofit organization that has been providing community-based fundraising guidance to patients and their families for more than 30 years. All donations are tax-deductible, are held by HelpHOPELive, are held by HelpHOPELive in the Southeast Spinal Cord Injury Fund, and are administered by HelpHOPELive for injury-related expenses only. If you would like to make a contribution please click the DONATE NOW bar.Thank you in advance for your contributions and continued support. August 18, 2016 the phone rings twice – two voices one of hopelessness and one of hope. 9 AM My beautiful wife, Julie, learns that her gall bladder surgery scheduled for later that day is canceled and replaced with a diagnosis of advanced pancreatic cancer – hopelessness calling. 2 PM A call from California UCLA to our son, Chaz, inviting him to be part of a “pool” for a clinical that may have the potential to restore the use of his hands 14 years after his diving accident on August 10, 2002 — hope calling. My God, life can be so cruel and yet love can overrule everything. Without hesitation, Julie looked at Chaz and said , “You are going to do that trial no matter what and I don’t want to hear anything else” knowing full well that her health would only deteriorate and she would not be able to go to California with him. For 14 years, Julie championed Chaz, kept him healthy, and shared with him the highs and the lows that came with this devastating injury. She never once gave up hope that the world of science would come through. Sadly our beloved Julie passed on October 23, 2016, a mere eight weeks after those phone calls and to the day she insisted that Chaz go to California. She looked hopelessness straight in the eye and never flinched. Not one complaint, no self-pity, fearless to the end and never using her illness as a reason for him not to go. We will do everything we can to see that Julie’s dream of Chaz having the chance of being set free from the shackles of his injury, along with the thousands who suffer the same fate, comes true. Clinical trials came with a cost — treatment is covered, but those who are selected to participate must bear the burden of travel, lodging and meals along with caregiver expenses. We as a family are humbled by those who are willing to help and will be forever thankful. Let hope overcome hopelessness. We heard of your story from Adele, We wish your amazing strength to continue as you make more and more progress. You are an inspiration! Thinking of you and sending our love. Wishing all good things for you in 2017. So sorry for the much too soon loss of Julie, our thoughts are with you. And for this new adventure.....we are hopeful that this will be a fulfilling journey for both of you. Sending you warm hugs and well wishes. We all think of you often. You hold a special place in our hearts, just as your mom did. Please give us an update on how you are doing. We are thinking of you at this difficult time. Please know that if love could heal, you would be in perfect health. May 2017 be a better year for you and your family and bring good things your way. Chaz, I have always believed in you. You have been fighting so long and along the way improving lines of communication and hope for SCI for so many others. You are not in this alone.